Sapporo (札幌市, Sapporo-shi) listen (help·info) is the fowert-lairgest ceety in Japan bi population, an the lairgest on the northren Japanese iland o Hokkaido. 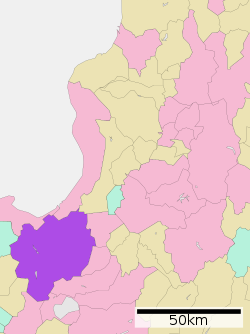 Locatit in Ishikari Subprefectur, it is the caipital o Hokkaido Prefectur, an an ordinance-designatit ceety o Japan. Sapporo haes relationships wi several ceeties warldwide. ↑ City of Sapporo. "City of Sapporo". 札幌市. This page wis last eeditit on 27 Julie 2018, at 06:15.